GenerEOS Interviews Infiniverse – What’s around the corner for AR? Samsung is has recently exploded onto the scene with their Cryptocurrency backed phones. 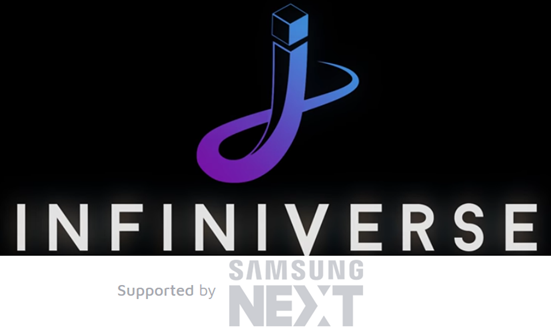 Samsung has also donated $50,000 towards the Infiniverse Project. Samsung and Blockchain are HOT and Infiniverse is a project which is embracing both. We take the time to sit down with Neb the founder of Infiniverse for a 1 on 1 about himself, Infiniverse and beyond. Infiniverse is a great & exciting project that intertwines Augmented Reality with the EOS Blockchain. Neb’s passion for Augmented Reality has shown him a path that he believes Augmented Reality, will be an everyday use scenario in people’s lives, from work, personal use and many more other directives. Pokémon GO has been a good sign of things to come. We welcome Neb and thank him for his time on this interview. Richie M — GenerEOS — How did Infiniverse start? I’ve been working in augmented reality for over 5 years. I spent almost 3 years in the San Francisco Bay Area, working for a start-up called Meta, building augmented reality glasses. Since then I’ve freelanced on AR projects for companies including Microsoft, Airbus, and Verizon. I love AR, I’m absolutely convinced that in 10 years we’ll all be using some form of AR all the time, as much as we use smart phones today. Blockchain I’ve been curious about for a number of years, but got a lot more into it couple years ago and I found a useful way to combine augmented reality and blockchain technologies. Your main ingredient of Augmented Reality has “roasted or baked well” with another technology, being Blockchain. Do you think Blockchain would evolve with Augmented Reality? They are evolving separately, but they may well end up reaching mass-adoption in a similar time-frame. There will be plenty of AR use cases that wouldn’t benefit from blockchain, but for Infiniverse in particular, we think it’s quite important. We hope to build a real, thriving economy and want to give our users security and transparency over their ownership of digital assets. Looking at and into Infiniverse we witness a trend for being able to buy and sell land. Will Infiniverse be land-based real estate or over time, it might incorporate many more digital items? As I said, I love AR, and there’s going to be so many great AR apps and games coming out. Pokémon GO showed the potential and continues to have millions of daily active users. But the problem is, you can only use one of these AR apps or games at a time. So, with Infiniverse, we’re creating a platform that allows us to combine all this diverse digital content, into one persistent virtual world on top of the real world, where they can all co-exist and even interact. Instead of just playing Pokémon, or just playing Harry Potter, I want Pikachu fighting Hermione and Batman dancing with Homer Simpson. In Infiniverse, the world has no theme and all content is user created. We can experience all kinds of different themes and diverse content co-existing and interacting. It doesn’t have to be just gaming and entertainment either, but anything you can imagine. It could be interactive ads, digital art, educational use cases, AR concerts. It’s all about creating a persistent digital layer on top of the real world full of weird and wonderful things, all coexisting. We’re extending the whole world and hope someday people will be just as excited to go out and check out what’s going on in the digital layer just as much as they are about the real world. Going back to your question: users are owning a lot more than just digital land. However, the land is still a crucial part of the economy. Owning land gives you the exclusive right to place persistent digital content in that location. Because we consider digital space, just like real-world space, to be a scarce resource. If anyone could place anything wherever they wanted, popular locations would quickly become a big mess of overlapping virtual content. Being creative is the real key here in terms of interaction. Users may experience an abundance of interactions, is there an SDK to compliment creators to be able to add to this digital world? Absolutely, creativity is vital. Right now, in the initial Beta, users can place 3D models from Google Poly (a library of free 3D assets) on their land. We are building our own system so that users can upload 3D assets directly to Infiniverse. First they will be static 3D models, then we will support animations and finally, we will release an SDK to create interactive experiences and mini-apps. I’ve had content creators that build content for virtual worlds like Second Life and Sansar reach out to us, and they can’t wait to get their digital assets into Infiniverse so that users can experience them augmenting the real world. Further down the line, we also want to build tools to make it super easy for people to create simple interactivity, as not everyone is a programmer. But one cool thing about building on EOS is that we can relatively easily support other Dapps integrating into Infiniverse. For example, we would love for users that have some characters they received from playing Mythical Games’ Blankos game, to be able to import them into Infiniverse, and place them on their land, or carry them around with them, and have them interact with all the other content in Infiniverse. That sounds exciting! Especially when other content creators reach out to you and your team. How many are on the team and what’s the joint time of expertise? There are three core team members right now. I founded the idea and lead the project, and you already heard my background in the introduction. Vladimir leads the development of our AR app. He has worked on projects for companies including Apple and Virgin America. Rutgers leads community management and has published a book on cryptocurrency trading. We would love to expand the team as soon as funding allows. We also have some fantastic advisors, including Dr. Steven K. Feiner, Professor of Computer Science at Columbia University, who has been researching Augmented Reality for over 20 years. Dr. Edward Castronova, Professor of Media at Indiana University, who specializes in the study of virtual world economies. In addition, we are supported by Samsung Next, from whom we received $50,000 for a collaboration project. Now that’s even More exciting! And being a project looking for traction it can be a test. Samsung obviously just don’t throw cash around. Congratulations Neb and Team! Where do you see yourself against your competition? And another question, do you have any competitors? For starters, some people might think that we are competing with projects like High Fidelity and Decentraland. But we don’t consider these projects competitors, as they are Virtual Reality, while we are Augmented Reality. In fact, we consider them to be complementary. Sometimes you want to sit at home and completely immersive yourself in a digital world, but other times you want to go out, explore and experience the real world interacting with virtual content. In the future, we would love it if users could share their digital assets between Infiniverse and High Fidelity. On the other hand, we have seen a few projects doing something more similar to us, albeit on Ethereum. One of them already died because their ICO failed. We didn’t build a team to do an ICO, but to build a product, and we’ll keep building through blood, sweat & tears until we realize our vision. Compared to the others that are still going, we believe we’ll be able to build a solid user experience much quicker due to EOS’s scaling advantages. Our Beta is already live and received great feedback from our passionate community. Does Infiniverse have potential to be inter-chainable? Has this been thought of as there are quite a few leading Blockchains out there? Absolutely! We were thinking about this a lot recently. We would love to be multi-chain. Including different EOSIO chains but even other chains like Ethereum and Tron. That way an Infiniverse account would be backed by the user’s favorite blockchain. EOS users would still have the fastest experience ;). A lot of technical challenges to be solved before that is possible though. As inter- chainable options are possible, what may or would tilt you towards TRON or ETH? Would say NEO or ADA be possible? I’m not knowledgeable enough about NEO and ADA, but in general we would like to support as many as possible to increase our potential user base. Crypto people can be a little tribal and unwilling to switch from their favourite chain. Right now, we need to target the cross-section of EOS and augmented reality enthusiasts. With more chains, we can target AR + blockchain in general. And with easy account creation we can target just AR enthusiasts. Our potential user base will be exponentially larger then. Do you think Infiniverse might tackle E-Commerce one day to some degree? The Infiniverse marketplace and economy is key to the success of the platform. Second Life, an old virtual world which Infiniverse takes some inspiration from, had users creating and selling $60 Million per year worth of digital assets. With AR, we believe people will feel that the digital assets are more valuable, as they can bring them into the real world. Will Infiniverse have a “tipping” feature for users? Yes, some users have requested to be able to send tips when they come across cool land. We always value our users’ feedback and will definitely be implementing it when we can. As a personal question, what technology “got you hooked” whilst growing up? I was into gaming growing up. Especially Counter-Strike. I spent my nights after school having “wars” with my clan against others. Although I don’t usually describe Infiniverse as a game but a virtual world. There’s definitely a lot of gaming applications possibilities to be built into Infiniverse. From all of us at GenerEOS we would like to Thank Neb for his time in this interview. It has been a pleasure in being able to have these questions, let alone being able to ask them. We wish Infiniverse the best and cannot wait to see more.